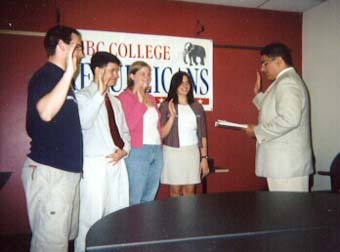 Officers are installed by President Afkhami. Our mailing address is UC Box 40, 1000 Hilltop Circle, Baltimore, MD 21250. We may be faxed at 1-240-248-4325. This site designed and maintained by John Williams, Executive Director. Copyright 2001-2002, UMBC College Republicans.